DJing for Str8jacket’s 90’s jam this Saturday, see you there! Blast to the past with Str8jacket! We will be hosting a 1V1 All-Styles 90s-Themed Dance Battle!!! 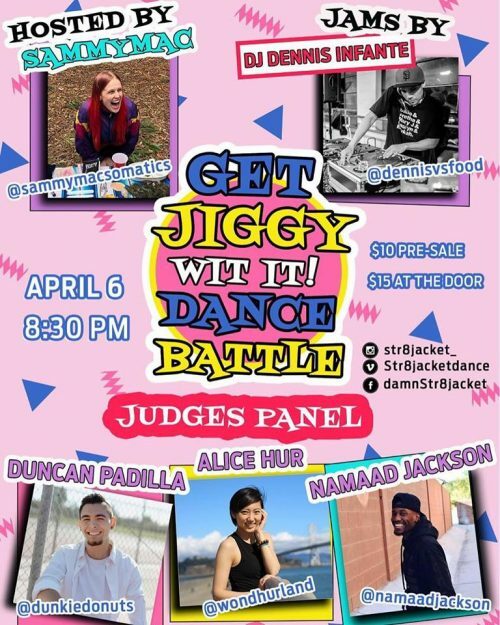 This is Str8jacket’s 2nd annual Winter/Spring Dance Battle. We are dedicated to bringing dance events to the Peninsula for the Bay Area Dance Community. Once paid, we will then e-mail you a confirmation. – 1V1 battle, prizes, Live DJ, snacks, drinks, and MORE!!! – Check-in at the door, plus security bag check. – 21+ wrist bands. Drink prices TBD. – Individuals causing harm to others, themselves, or damaging property will be escorted out of the building. – Help keep our studio clean! Let us know if you see a spill and we’ll take care of it! – Do NOT litter. Throw your garbage in trash bins please. – Str8jacket and CY Danceworks are not liable for lost, damaged, or stolen property. **All proceeds goes to Str8jacket’s fundraiser! For more information, click the link below!